It’s the heart of summer in Greece and the veggie markets are divine. Tomatoes,tomatoes and more tomatoes. Zucchini, zucchini, and more zucchini, yummy and much cheaper than in Whole Foods. It’s paradise. Another great thing in Greece, it’s the Sunday papers. They come packed with extra magazines, great classic literature books, cds, you name it…. Last Sunday I delved into two cooking magazines, “gastronomos” and “gourmet”, searching for recipes with veggies good for our family and mydinnertoday, i.e., healthy, easy, yummy. I made a bookmark on this one. It was posted on gourmet and signed by Makis Georgiadis. Excellent summer dish. We all liked it. I made several substitutions and they all worked fine. How to make: Saute the chicken pieces in a big and deep pan until lightly browned. Add the onions and zucchini and saute for another 5 minutes or so. Add the ouzo (or tsipouro as I did). Add the rest of the ingredients (except the mint). Reduce the fire and cook for another 10 minutes. Take the food off the fire, sprinkle with mint and serve. 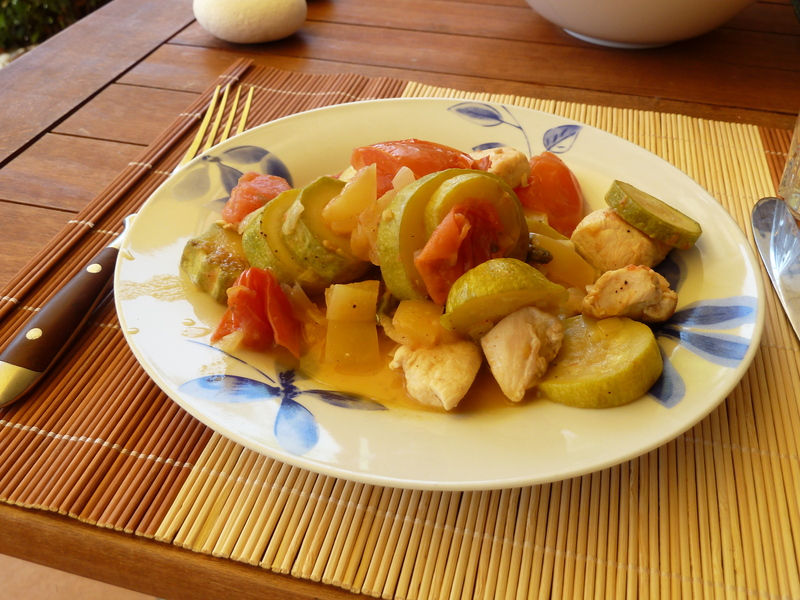 It is a great Summer dish! I saw it with the name “Kapamas” ! “Kapamas” is just the Turkish term for what in Greek is called “katsarolas”. In both cases, the food is slowly cooked in a pot covered with a lid. But “kapamas” is more used when the meat in the pot is beef/veal or “katsikaki” (goat) which take longer to cook and the veggies are added later. Stay tuned for today’s zucchini recipe I got from gastronomos and went so fast I didn’t have time to take a photo. Favorite food from the Gourmet!